KayKiSpeaks.com: Relationships Advice: Sarah Jakes & Her Fiance' Pastor Toure' Roberts Talk Relationships! 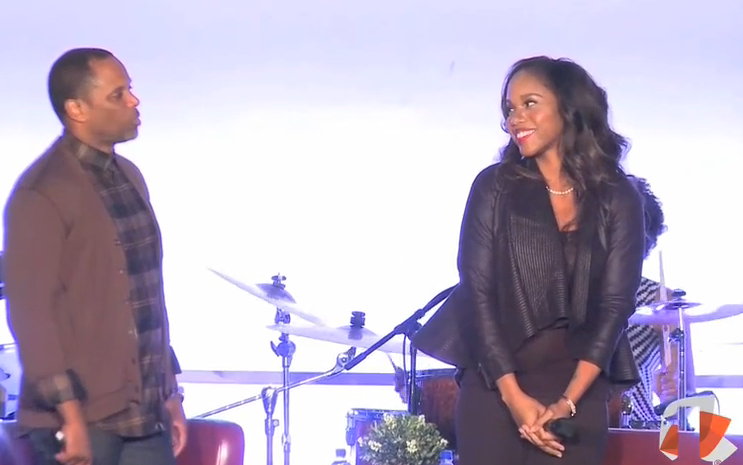 Relationships Advice: Sarah Jakes & Her Fiance' Pastor Toure' Roberts Talk Relationships! Before I get into talking about this video, I want to let you guys know how awesome Sarah is. In the spirit of social media.. let me give her my W.oman C.rush W.ednesday! Sarah Jakes was introduced to me on twitter. I knew of the last name, but I didn't really know anything about her. We followed one another on twitter, and then she heard my weird cry of having 999 followers on IG, and she came through with the BOOM to get me away from that weird number (LOL). She just comes off as genuine and querky, and semi reserved in a sense. As I started to pay Sarah attention I saw a lot of myself in her. We have very similar backgrounds.. popular Pastor dads, powerful mothers, talented siblings, and the all too familiar microscopic lens on our lives because of it. As I read her book, Lost & Found I read so much of my own life story.Of course Sarah being Bishop Jakes' daughter was a whole next level kind of situation. Even though my microscope was city wide and hers nation wide, I felt her heart SO much. The lessons found in Sarah's life speak to all people, but as a Pastors kid, I was really thankful that there was finally a voice that not only spoke on our behalf, but that could also help Pastors and other leaders learn about what their children face. Excellent work. When I finished the book, I couldn't stop talking about it. I've encouraged others to get it and see what an amazing story of grace it is. Since then Sarah has been on the move. She's released another amazing book- Colliding With Destiny, which Im smack dab in the middle of reading right now. Again, another book that is powerful, honest, and really inspiring. Sarah's instagram posts and tweets are just as elegant as her books read. She's gifted in words in a way that I can't really explain. There's a simplicity in her approach that is taking the limits off of who will listen and who will be able to comprehend. I just love her work. Recently Sarah decided to spend the rest of her life with another person- who is very similar to her in my opinion. It's crazy, because Toure' Roberts is a known Pastor, Author, and motivational force. I've known of him for years..longer than I've known of Sarah, but if I had to link her to her male equivalent- it would've been Pastor Toure'! So imagine how cute it was for me to realize they were actually dating?! The two exchange cuteness over social media here and there, and it's obvious that they're smitten. With that being said, we haven't seen them together on a platform discussing their relationship until now. Sarah and her "Babe" took the stage at the church he pastors- 1 Church in LA for a night of honest conversation about love and their relationship. I've seen this link on my timeline a few times and skipped right over it. Last night was different because in my personal life I'm juggling some pretty serious questions about relationships, love, marriage- all of that. I've been praying for about a week for some answers, and when I saw the link last night I just knew I had to get into it. I'm so glad I did. This post is WAY longer than I originally planned, but I wanted to establish how much Sarah has been a gift to my life in so many ways. She's truly a sister from a far. Last night I teared up at times watching this because here I was praying for some specific answers and clarity over specific feelings I've been having.. and here comes Sarah in this video with the answers. God is awesome. About 5 minutes into the video I jumped up and grabbed my new journal to start writing notes and my revelations from watching this. I recommend this video to anybody who is trying to figure out relationship stuff. Some way through telling their story and being honest about their experiences, they spoke directly to my fears and doubts. I'm sure this will help you too! These two are adorable together. The way Sarah blushes for 15 seconds at the top of the video is just the cutest thing. What I'm most excited about though is that we're witnessing the true meaning of a power couple here. Young, vibrant, talented, willing, and strengthened by God's grace. There is so much work happening through these two individually. I'm excited about their collaborative effort. They are regular people, but their insight into the complexity of the concept of meeting, accepting, engaging, and experiencing love is extraordinary. Check it out below! Sarah is bae! Love her and love you Kayki, happy 5 year birthday to your site too.